This article sheds some light on the purpose, scope and methods of conducting merchandising audits. The intended audience is merchandisers, retail operations professionals, area sales professionals, consumer packaged goods manufacturers as well as wholesalers. Planogram compliance. Correct position on the shelf. Correct number of facings. No product “holes”. No out of stocks. Pricing. Correct price displayed by market and category. Correct label used. Across these broad categories, compliance is assumed to mean that a certain set of standards is met in a given time frame (duration of the program) at certain locations (seasonal programs may not be executed consistently across markets so the ability to “narrowcast” certain standards at certain locations is essential). Unfortunately, merchandising compliance alone does not guarantee that a merchandising program will be a success at store level. Merchandisers need to look at the big picture and ask, for each store, “Would shoppers shop here?”. For this reason, we will add another non-merchandising category to our list of merchandising audit categories. The best merchandising program, even if implemented in time and in full, will be completely ineffective if shoppers won’t set foot in the store or if the general presentation, cleanliness, orderliness or safety of the store is not conducive to a positive customer experience. In this sense, merchandising audits should not be conducted in vacuum. While your district managers, sales reps or other resources are in the store , have them conduct one or more audits on broad operational factors such as general cleanliness, safety and security, just to name a few. It does not have to take a lot of time and paints a more complete picture that gives some context to your merchandising program. The merchandising audit should ideally take place in all stores. Should this not be a possibility, pick a representative set. If you do not audit all stores, be sure to pick stores that truly represents your various markets (geography, socioeconomic factors, etc…) and store formats. Make sure they happen! The software or service you use should be able to tell you exactly who has and hasn’t done audits and where. Don’t assume audits are conducted, get quantifiable proof and detailed reports. Time stamps and photos don’t lie, get them! Make sure that issues are addressed! An audit has more value if non-compliant issues are addressed and remedied. Again, software should help you with this. What has been assigned, to whom? What hasn’t been fixed? What’s late? Turn the audit into a vehicle for improvement and remedy issues before they jeopardize the success of the merchandising program. 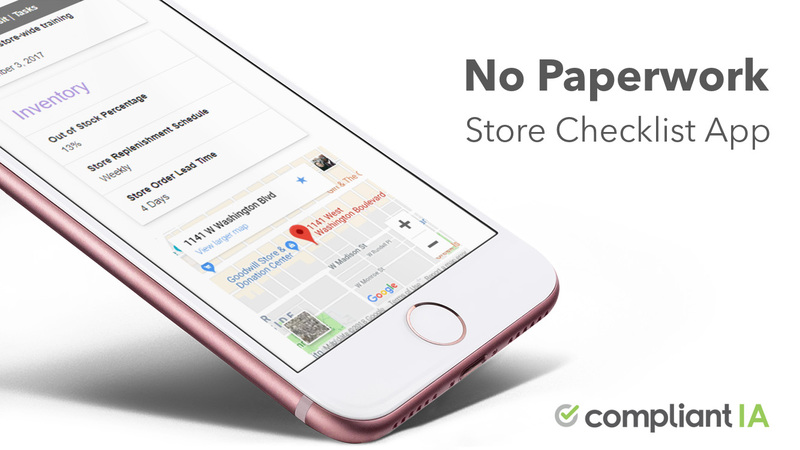 No store likes being “audited”…until you give the store something back! The word “audit” is often met with resistance initially. It doesn’t have to be this way. Give something back to the store. Help them track and manage their strengths and weaknesses. Use the “audit” as a vehicle for continuous training (include best practice photos and descriptions), not as a tool for finger-pointing. Let them comment on the audit and outstanding issues. Show them best practices with words and pictures and save them time. A store audit is an opportunity to grow sales and, if you put the right process and software in place, you will experience a “bottom up”, grass-root endorsement for your standards and significantly higher compliance. Should you conduct merchandising audits internally or use a third party? 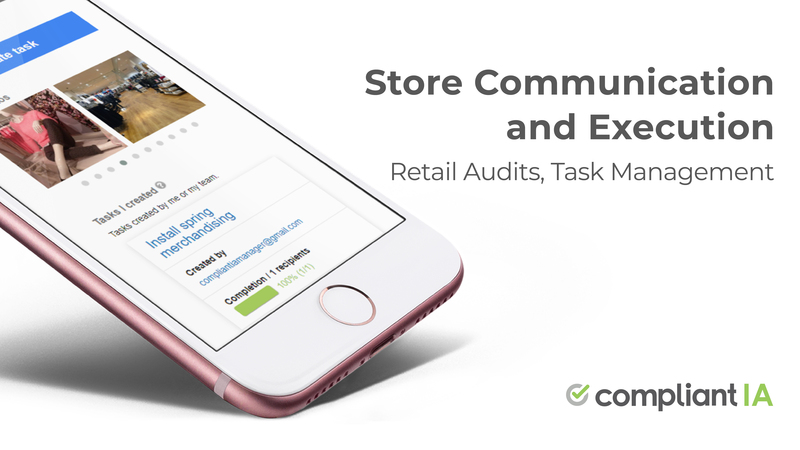 Some companies, like Compliantia, sell turn-key mobile and tablet friendly software for retailers and manufacturers to audit their own stores, internally. Other companies offer a “merchandising service”, akin to a mystery shopper service, and send individuals under contract to audit your stores. You should conduct audits internally if you have the resources to do so, want to control quality and/or don’t want to outsource a core competency like merchandising compliance. You should conduct audits externally (outsource), if you lack the resources internally and have no concern with the quality and reliability of an outsourced service.